It's that time, Europe, and after two weeks of being delayed by a day the Download Update information has been unleashed promptly to kickstart our week. It includes an intriguing cross-platform release on Wii U and 3DS that could fill a nice gap in the eShop library, two NES titles and a host of discounts including some excellent games from Shin'en Multimedia and Renegade Kid. Without further pre-amble let's get to it. 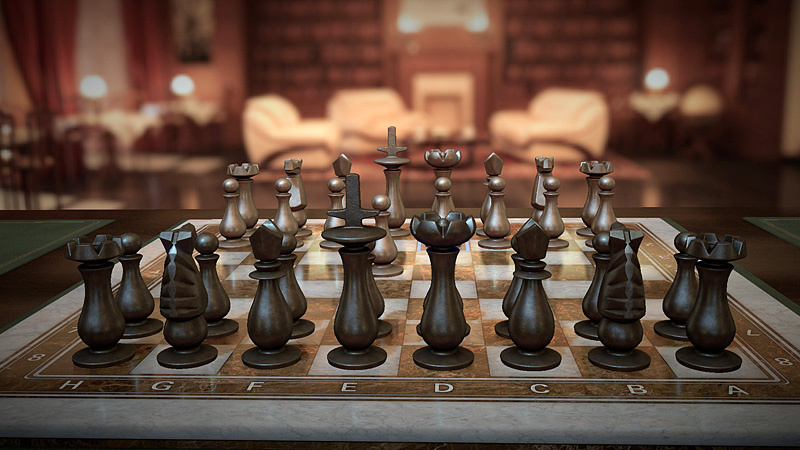 Pure Chess (Ripstone, €5.99 / £4.99) — Arriving perhaps a little later than expected, this title — developed by VooFoo — arrives with some attractive HD visuals on the Wii U, as well as multiple control schemes, modes and tutorials. Most exciting is the news that online matches will be cross-platform between Wii U, 3DS, Android and iOS players, greatly opening up a world of opponents. Keep an eye out for our extensive coverage later this week, while in the meantime you can check out our Pure Chess hands-on impressions from last year. Castlevania (Konami, €4.99 / £3.49) — This is where Konami's iconic series began on NES, and now completes its quest across all currently available Virtual Console platforms. Full of classic moments, this action platformer is also pretty darn challenging and certainly a test for gaming veterans — we were still fans in our most recent Castlevania review. This is the US version of the game. 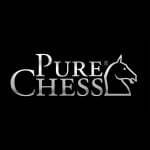 Pure Chess (Ripstone, €5.99 / £4.99) — This is the same title as that on the Wii U, albeit substituting HD visuals for autostereoscopic 3D. We'll provide coverage of both versions later this week. 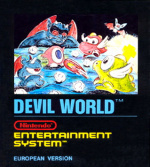 Devil World (Nintendo, €4.99 / £3.49) — One of the lesser known early NES games from Shigeru Miyamoto, on the surface some may consider this a Pac-Man clone; that would be a tad inaccurate, as it stretches out the core idea of dashing around a maze with alternative objectives and clever twists to the environments. This may be fun on the go, and we were fans in our Wii Virtual Console Devil World review; we'll give this another whirl. OMG! Please bring Devil World to America this time, please, PLEASE!!! At this I really don't know what to say. Can't say there's anything appealing at the moment. Great week! Chess is awesome (and so is discounted Mutant Mudds)! Pure Chess (Wii U) here I come. 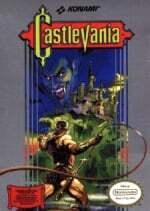 Castlevania should be on everyone's list! I would be getting that first, and then Pure Chess. It's a shame to see it's still on 0%! More of the classics for Virtual Console please! @Nintenjoe64 For me, it's all in April after I finish DKC: Tropical Freeze. Shovel Knight, NES Remix 2 and ALL THE GBA GAMES. But after April, I have no idea. Not interested in Mario Kart. Maybe 3D chess. Just maybe. So I'll be waiting till May before I properly play my Wii U at this rate. It seems like more people are getting increasingly fed up with this situation as each week goes by. Does anyone from Nintendo read this in order to see the frustration? I know a lot of people moan that there's no releases but I kind of like that there's not as much to buy, for one it means I can complete the games I have and also save money which makes me able to afford the special editions like thhe mario kart 8 bundle on the official nintendo store. The problem with gaming these days is there is to many games to choose from these days makes it harder for someone who has less time and more commitments to complete anything. @PinkSpider Its called choice dude,and wiiu has little of it. @JohnG There's not much Nintendo can do about it right now. They coupled the Wii U with the Gamepad, it didn't take off, many developers don't want to develop for it. Hence the lack of games, especially interesting ones. Yay, 60Hz Castlevania. I will definitely do the upgrade for this one whenever i transfer all my Wii stuff to the Wii U. Might also get Pure Chess if it's got good tutorials and things like that. I'm looking forward to playing Nintendo Life at Pure Chess. Please set up a tourney ! 3DS discounts are looking fine. Have to take a look at the Mutant Mudds for this week. Maybe also Jett Rocket II. damn didn't see the option for both Chess games haha I meant that one instead of just Wii U..oh well. Most likely Pure Chess on the Wii U, but I'll read the review first. Would be nice with a discount if you are getting it on the 3DS as well. Good thing Dark Souls 2 has arrived. OH MAN ANGRY BUNNIES IS ON SALE!!!! @faint The difference isn't all that big, and it would help if there was a wider retail presence as well as downloadable games from bigger publishers. Just think back to the recently cancelled Pac-Man collection - which still came out on other consoles. That's just the tip of the iceberg in showing that even download games are avoiding the eShop. Slightly tempted by Jett Rocket & EX on the 3DS. Will probably just wait it out for a bigger sale. If Europe can have Devil World then surely due to its more reasonable stance the Binding of Isaac should be fine. @hiptanaka we have known for months it wasn't coming they didn't even want to release the first on the u during launch when sales were great. It sure is a shame those other platforms won't be getting bayonetta2 tho isn't it. @Mahe um child of light and batman black gate hd both come next month as far as big third party downloadable content. Namco used working on wii sports and smash bros as the excuse with pacman stating the u version had fell behind in development because of it. Stupid me for getting my hopes up and thinking there was going to be something actually worthwhile to download this week. Chess must be the punishment. Yes! 60hz Castlevania! I've really been looking forward to this! I hope Castlevania 2 will also come to PAL-land soon. "After Castlevania I warned you not to return!" Here's hoping that one day, history will me made for NA on Devil World. The closest appearance in figure it has come was a character/image of it in Art Style: PiCTOBiTS. Doubt NoA will import Devil World though, but hope I'm wrong on that! @tripunktoj: I second that! Devil World please! Can we have Devil World in the US too? Is that too much to ask, Nintendo? The releases themselves are bad enough, but good god the prices make it seem that much worse. I just got the ultimate edition of castlevania lords of shadow for 4.99 on steam a few weeks back. What's going on theirs virtually nothing to download for the Wii U, Castlevania's a decent game but more titles really need to be made available. Another week of saving money. I really wish Nintendo could bring at least 3 vc games a week. At least once GBA and DS VC are released things will likely improve since there are a ton of first party titles on those consoles. I think we'll eventually even get the Pokemon games via Wii U VC given the desperate situation the Wii U faces. So I wouldn't count the Wii U VC out just yet. Plus I'm sure most third parties are still under contract for their GBA and DS games so third parties would either have to release said classic games on the Wii U or not release them at all, so things could improve quite drastically in the upcoming months. I was just playing devil world this weekend...it's strangely addictive. Cool to have just based on it being one of Miyamotos first games...and I think it's harder than Pacman. Of interest is the devil in this game...he looks like Ganon from the original Zelda, yet this game is from 1984. I'm tempted by Castlevania, but I need to work on my backlog lol! @PinkSpider I feel exactly the same way. the amount of games coming out and go on sale each week is actually pretty staggering. I also am a compulsive buyer. back in the old days waiting for games made me appreciate that game a bit more Thank god I only play one system these days. (3ds) I couldnt imagine playing all of them as fast as games do come out. I'm not into the VC games but really they should be loading up in that department. Whoa you guys sure are pissed O.o. Have you thought about the possibility that Ninty will release a couple more VC titles following the direct? It's not uncommon, they do that all the time! I'll have my hopes up because I'm pretty sure we'll get a direct sometime this week. Advance war DS VC PLZZZZZ. I have always wanted to get Devil World. Europe always gets our NES and Game Boy exclusives, so why can't we have at least one of theirs? All I'm asking is Devil World, Fire Emblem, and the Mother series to comes to the 3DS VC Nintendo. I'm not sure why people expect so many games a week - and generally it's ont just a particular number of games, but rather a particular number of games that they like, which is different to the type of games the next eprson likes. If Nintendo tried to keep everyone happy, then everyone would be disappointed with the shovelware on the system. It takes time & money to make a game (even a VC port), and Nintendo can't pull them from nowhere. Personally, I'm getting Pure Chess. I was liking it before, but the low price is making me want it even more. @MadAdam81 Don't think it is unreasonable to want a decent amount of stuff across a diverse set of genres you like. Shouldn't be necessary to buy stuff you don't really even want just because there is no other choice. This looks like a good week of EU eShop, to me. I think perhaps that people who own a 3DS OR Wii U, but not the other, are the ones being disappointed. If you have both consoles, alot more content comes out every week, obviously. Wow very bad week once again! What the hell is going on in NOE HQ? Sure the sales are great for people who missed the last sales of certain games, keep that up! Things are so bad on the eshop that I went onto the Wii shop channel yoke thing at the weekend and bought Mario64, Chrono Trigger, Mario RPG and Sonic 2. Wow the camera is annoying in Mario64, it could use an update. Sure it's great to have these games but I want them on my WiiU not emulated Wii. I do have €50 sitting on my eshop account for ages so technically Nintendo already got my money so why would they add stuff to the eshop. I would think when the GBA and DS games come to the WiiU eshop it will be the same, 3 big games the first week then maybe one a week or nothing after that, trickle them out just like always. Sad state of affairs overall on the eshop. Also I am pretty sure Pokemon games won't come to WiiU eshop, as the company that make the games do not want them on home console no matter what. Don't you think we would have at least seen one Pokemon game on the 3ds VC by now? Wouldn't hold my breath on that. Also, I'm totally not a fan of pokemens so, bla.